Living a Fit Lifestyle is what we modern women desire the most, but at the same time struggle with the most. You’re dedicated to your career, have busy family life, and uber chaotic schedule. At the same time, your fitness is important, you’re hitting the gym and have done every diet under the sun. Yet, you can no longer squeeze into your favorite pair of jeans and really don’t feel all that hot about yourself. You feel like you’re doing everything right, but progress seems to be painfully slow. Do you blame your age? Is it your metabolism? Plagued by cravings and unhealthy eating habits? Nutrition is certainly key when it comes to reaching your goals. Working out, however, is a science in itself! Now, I hope you don’t take this the wrong way, but just because you spent an hour in the gym doesn’t mean your body is going to change at all. Just as your creating a meal plan for yourself, you need to plan your exercise and focus your efforts on what’s going to get you the greatest bang for your buck so to speak. We are all busy. Who has time to waste in the gym? If you are going to workout, you need to workout smarter and not harder to really see results in the least amount of time. So, are you ready to shave some time off your workout calendar and get your body to the next level? 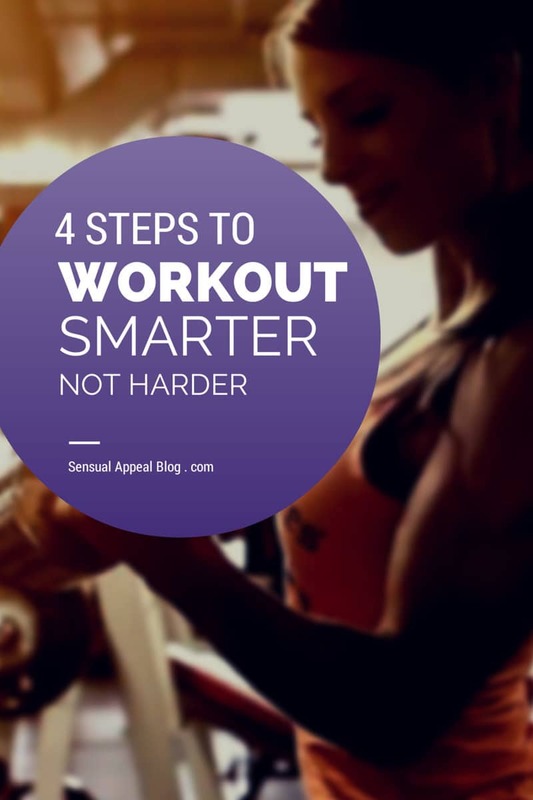 Then read on for the 4 Steps to Workout Smarter and Not Harder. This step may sound very obvious, but many women frequent the gym or workout at home without an actual workout plan in place and a way to track their results. Every body and physique is unique. We all have our strengths and weaknesses as well as areas we really want to improve. Furthermore, health concerns or limitations may make it necessary for us to create a plan that either includes or omits certain movements. Without a workout plan that includes specific exercises, rep ranges, and sets, that is targeted to meet your specific goals and needs, it is impossible to reach your goals and measure progress week to week. Having a workout plan that you follow for a good amount of time (usually anywhere from 4-12 weeks) will allow you to be prepared and efficient in the gym and track your progress week to week (are you able to lift more? Do more reps? Finish the workout quicker? and so on). This step is simple – Ditch the cardio! What? Ditching your cardio? How could I possible advise you of doing that? 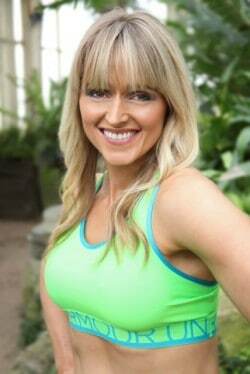 Women are well known for their addiction to cardio mainly due to lingering myths of getting bulky or big and due to misinformation and a lack of education. How do I define cardio? What I’m referring to are cardiovascular sessions that are steady state and your heart rate stays in the low to mid range. This includes jobbing, running, walking, elliptical work, and most group exercise classes. We all want a lean and toned body, yet, our workouts don’t support those results. Long cardio sessions (30 mins or more) are detrimental to your physique in the long term. Now, if you enjoy cardio as a way to resolve stress, then by all means go right ahead and do it. There are many health benefits to cardio. However, if your goal is to workout efficiently and get the best results in the shortest amount of time, then cardio is NOT your friend, because every cardio session is catabolic and will lead to at least some loss of muscle for most women. So, if your main focus in the gym is cardio, your result will be the “thin but flabby look” instead of the “lean and tight look” you really want. Most women falsely assume that cardio is the panacea for fat loss, and so they embark on a cardio regimen while neglecting resistance training. Huge mistake. When women do cardio, their sole focus is on burning as many calories as possible. Usually this doesn’t produce the results they’re after – “toning up” and looking better in and out of their clothes. If you’re a woman reading this, chances are you know what I’m talking about. If what you’ve done in the past hasn’t produced the results you’re after, why would you do it again? Take a challenge and give proper resistance training a shot. It’s a great way to achieve the body you’re after, and it’ll give your self-confidence a huge boost, too. What you should focus on are short duration, high intensity type conditioning sessions that will get your heart pumping and your muscles working at the same time. These sessions should not last more than 15 – 20 mins max and have you maxed out by the end. The intent is to go all out, work hard, take minimal rest and get your heart rate up high. Why is this type of training the most beneficial you ask? Firstly, it increases your metabolic rate, which will compound the fat burning effect and have you burn more fat after your workout. Secondly, it will not only speed fat loss, it will also help you continue to build lean muscle mass. Try the conditioning circuit below! Strength training is the best way to lose fat. Think lifting weights will make you big and bulky? Sadly, this is still one of the most common myths about what will happen to women when they start strength training. Building muscle isn’t what makes a woman appear “big ‘n bulky” – excess body fat does. So, the solution would be to lose some body fat. And, if you want to look absolutely awesome, build some muscle! How often should you lift? Generally 3 times a week, including a full body focus, or 4-5 times a week focusing on different body parts, is what I recommend. A session could be as short as 40 minutes in length when you’re moving through the exercises without distractions. So put away your phone and shut off Facebook, at least for a the next hour or so. When you do lift, be sure you go heavy. Put your pink weights to the side and challenge yourself! That means going to the max and pushing out every last rep. We also call this type of lifting “going to failure”. Push yourself – even if that means you have to growl or scream in the gym. The other women may look at you now, but will be jealous of your results later! Healthy levels of body fat and muscle is what allows women to achieve that lean, athletic look most of them crave. What percentage of body fat? I don’t believe women should aim for a specific number, but rather, they should train and eat to achieve the look they’re after. Use strength training to achieve your physique goals. If you by some chance you get all big ‘n bulky, feel free to give me a call and say I’m a horrible liar. I’ve extended this offer many times before, and so far, no one has complained about the results strength training provides. Just as Conditioning sessions are short and intense so are HIIT (high intensity interval) sessions. The difference between Conditioning and HIIT sessions are that HIIT sessions are non-resistance training based sessions, but that doesn’t mean they aren’t great for your abs, glutes, quads, and even your back muscles! One frequent mistake that women make is confusing cardio with HIIT training. HIIT training should have you go all out – go to your absolute MAX for a short amount of time and then recover. On the treadmill, it could take the form of 20 sec all out sprints followed by 45 secs of walking or even taking a complete break. Too many times, I see HIIT training done wrong. The rule of thumb is if you last longer than 10 – 12 minutes on HIIT, it’s cardio. Not HIIT. So, what are the benefits of HIIT? Let’s take the example of sprints. They are fast.They are fast in a lot of ways. For one, I define a sprint as an all-out, chest-heaving, muscle-burning burst where you are going as fast as you can for a short amount of time or distance. My humble opinion is that the best distances for sprints are 80m, 100m or 200m. If you are going much beyond 400m, we get into middle distance and pacing, which is not where we want to be for sprints. If you are not on a track, you can also go for time – aim for 20 or 30 seconds. So, we have these 30 second or less bursts of intense, full body movement. If you are doing 8-10 sprints, with recovery time in between, the workout won’t take very long, typically about twenty minutes or so. Sprints are a great thing to squeeze in when you don’t have a lot of time but want a killer workout. Sprints are hard. Ladies who are always looking for the next great physical challenge are well served by sprints, because as you improve and get faster and more coordinated, you can push yourself harder and harder, adding in layers of challenge for yourself. Sprints are the best way to get the B’s and the H’s that we discuss at Metabolic Effect – breathless, burning, hot and heavy. This translates into a full-body fat burning effect. Sprints are probably the best exercise for the midsection.We all know that abs are made in the kitchen, right? Of course, but that doesn’t mean we neglect them in training. Sprints target the abs, including the obliques, the love handle area and the ever-elusive lower abs to make the entire midsection look more tight and defined. Sprints help you break through plateaus.Feeling stuck with your physique goals? Measurements haven’t moved in weeks? Try throwing in a day of sprints. This is almost a fail-proof way to bust through places where we are stuck. Are you already doing sprints? Try hill sprints, or try mixing up your sprint routine. If you always do 100’s, swap to 80’s and 200’s for a few weeks. Sprints give you physical energy, rather than draining you of it.Contrast it with long duration cardio of many miles/hours and the usual subsequent hunger and exhaustion. Sprints train the whole body.There is no full-body exercise like sprints. In addition to training the glutes, quads, calves, hamstrings and midsection, sprints also train the lats and shoulders. Sprints can help you eliminate the need for long, boring cardio.True confession time: I don’t jog. I don’t do tempo runs, I don’t do marathons or half marathons or 5Ks or triathlons. They are not my thing, and I don’t need them. They are great for those who enjoy them, but if you do these types of things because you feel like you have to in order to stay lean, I invite you to try 3 sprint sessions per week for several weeks, and see how that suits you. You CAN have a great physique and reach your goals on a busy schedule. All you need to do is workout smarter, not harder. Focus on Strength Training to boost your metabolism and achieve a lean and toned physique.